Arman’s accumulations of single things from the everyday belong to a general theme in the art of the mid- to late 1950s: paintings understood as objects. This identification is already complete with Jasper Johns’ Flags, created since 1954, where the common conceit is for the critic to wonder if it were a painting of a flag or indeed a flag itself. Within Arman’s more immediate circle, Yves Klein objectified color in the form of his trademark blue pure pigment (since 1956, often with a relief-like surface on his paintings and later in sponge sculptures). From 1957 on, Piero Manzoni created pictures in a white he described as colorless, whose composition was formed by folds in the fabric, hanging like crumpled sheets over the stretcher. During the same year, Klein’s brother-in-law, Günther Uecker from the group Zero, developed nail paintings (a technique he then also transferred to objects like furniture or musical instruments). And in 1958 Lucio Fontana started slashing his canvases, which for him meant part of a spatial concept where the gap offered a passage into another dimension, but which is usually received as an act of controlled violence against the holiest of holy art objects: the canvas. This might not immediately appear as the proper context for Arman’s boxes of stuff, and yet the artist places himself within it when he writes: “Even in my volumetric compositions, my aim is always pictorial rather than sculptural. I want to see my proposals understood as involving the optics of a surface rather than a realization in three dimensions. On these surfaces the uniquely chosen element is a monotypic expression – although it is a plural one because of the number of objects – and therefore very close to the monochrome approaches of Yves Klein.” The work pictured above is Paradox of Time from 1961, and indeed on the most simple level it forces us to almost look at it like at a painting: we can see the collection of objects only though a single window-paned side of the otherwise closed wooden box. So as we watch the confined space from a fixed frontal perspective, the accumulation of old alarm clocks appears like an allover structure of similar forms, arranged in their container by chance and gravity without any attempt at hierarchization. 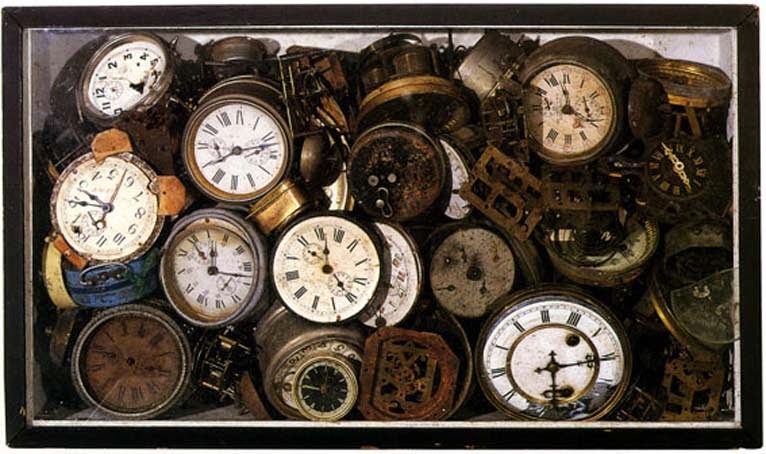 Arman had already addressed the subject of time more than once in his earliest accumulations from 1959. There the objects were still housed in small plexiglas boxes, much more like portable sculptures than single-view pictures. 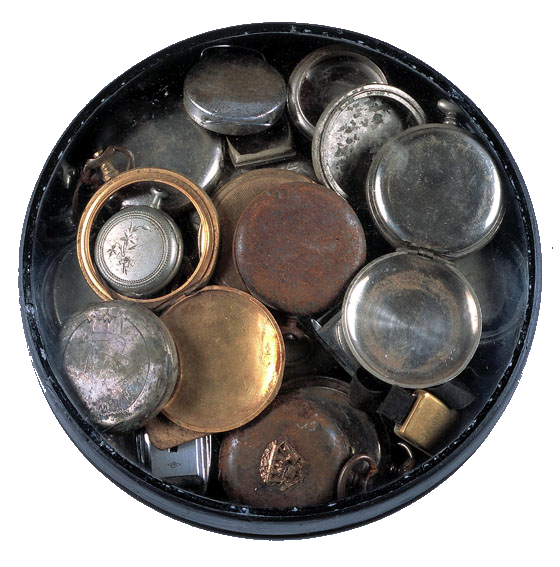 One of those collected cases of old pocket watches, another an accumulation of clock faces. 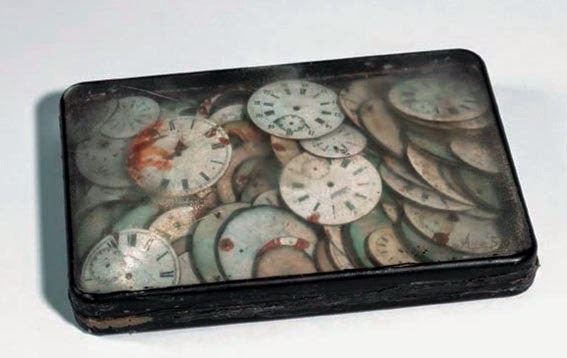 Both pieces remain close to a collection of spare parts so the object does not fully develop a conscience… It is only with his Paradox of Time that Arman managed to breath sufficient life and character into the wound-down alarm clocks to suggest the previous lives of everyday objects before their presentation as an artwork. Half a decade prior to Star Trek, the title does not yet allude to time travelers killing their own ancestors with unforeseeable (and therefore unrecordable) consequences (though not only in retrospect the idea already existed since the late 19th century). The Paradox of Time is a contradiction that we all know: we see time as a constant and use the watch as a tool for precise measuring. Yet depending on situation and occupation, individual time follows very variable speed lines, sometimes creeping along in utter boredom, sometimes hurtling forward like an express train (the standard image in explanations of relativity theory and time dilation). And indeed, for each and every clock in Arman’s work time also seems to pass at different speeds, marked by dents and traces of their history. The accumulation of time-measuring devices whose time has run out is like a classic memento mori, a vanitas still life of an object in quasi-cubist multiple perspective. 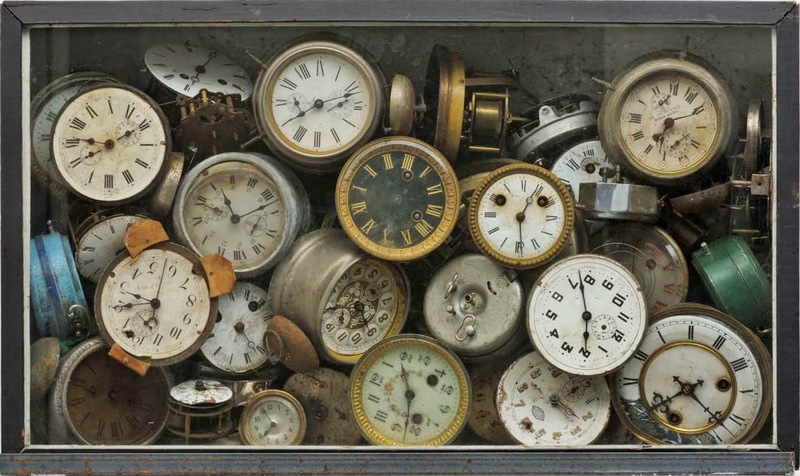 But the clocks are not quite dead, they are in an in-between – their differences take on characters (not through anthropomorphism, but by them being so very clocklike), they create a composition of individually formed same objects to form a very alive work. And since they are being accumulated here for probably forever, it seems that somebody still has plans for them. And on that hopeful note, Arman’s alarm clocks keep patiently awaiting their fate. (Happily, we can check on some of their fate. The photo on top of the page is a recent one, and above here’s one from the Arman website, some couple of decades older. Not quite static, not quite moving, as you can see. Shake it like a kaleidoscope and get a slightly new composition each morning.